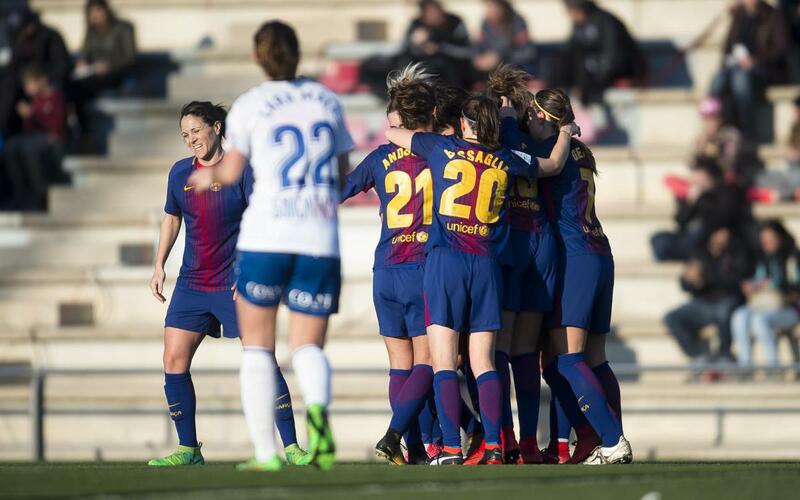 FC Barcelona Women started the second round of Liga Iberdrola fixtures with a comfortable victory over Zaragoza (2-0). The three points were never in doubt as the blaugranas took control of the game and attacked with real intent from the start. However, Barça only managed to score the one goal in the first half and they had to wait until the second to put the game to bed. The second forty-five minutes saw the home side continue were they left off as they added to Losada’s opener with a strike from Andressa Alves. Academy product Claudia Pina, who is 16-years-old, came on for her debut with the first team. Fran Sánchez’s starting eleven included some rotations but this didn’t stop his side from dominating the game and maintaining possession from the off. The blaugranas’ superiority was translated into a lead halfway through the opening 45 minutes when Vicky Losada rifled a shot into the top corner to put her team 1-0 up. The goal encouraged FC Barcelona to attack even more but they were unable to add to their lead, despite hitting the post. The first half was almost a perfect performance as Zaragoza were unable to create any danger themselves as they were penned back in their own half. The second half carried on in much the same vein as the first. Martens cut in from the wing and she cracked a shot onto the upright for her team’s third effort that hit the woodwork. Barça were completely dominant but still only one goal up. The team were patient and they got their reward as they scored a crucial second goal through Andressa Alves near the end of the game. The result was never in doubt but the goal served to put daylight between the two teams on the scoreboard and it capped off an excellent performance in FC Barcelona Women’s first game of the second round of Liga Iberdrola fixtures as they continue to fight for the title with Atlético Madrid. The next game is away to Albacete.